Episode #302 Part II: Superman Comic Book Cover Dated April 1963: Action Comics #299! Download Episode 302 part II! ACTION COMICS 299, April 1963, was published on February 28, 1963. It contained 32 pages for the cover price of 12¢. The editor was Mort Weisinger, and the cover was pencilled by Curt Swan and inked by George Klein. It featured the Supergirl story in the back of the issue, and was her 9th appearance on the cover of ACTION, and 10th including her solo appearance on the cover of Superman (I misspoke and said that it was her 14th cover appearance, misreading my checklist). - The 13 page Superman story in this issue was titled, THE STORY OF SUPERMAN'S EXPERIMENTAL ROBOTS, written by Jerry Siegel and drawn by Al Plastino. This story has also been reprinted in SHOWCASE PRESENTS: SUPERMAN vol. IV. It was also Siegel's 45th silver age Superman story, and his 137th overall for the era. Previously he wrote, THE HELMET OF HATE for SUPERMAN'S PAL JIMMY OLSEN 68, April 1963, which was pencilled by Curt Swan and inked by George Klein. 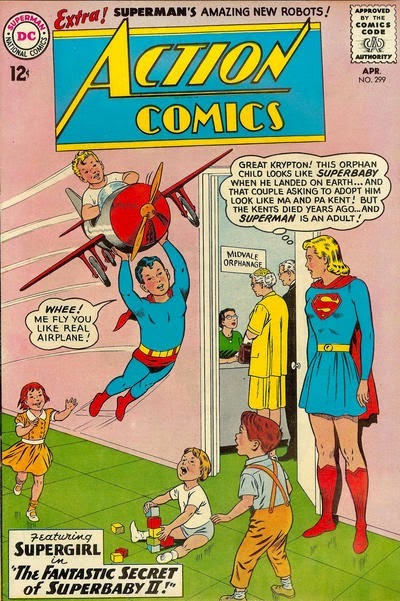 - The 12 page Supergirl story was titled, THE FANTASTIC SECRET OF SUPERBABY II, written by Leo Dorfman and drawn by Jim Mooney. This story was also reprinted in SHOWCASE PRESENTS: SUPERGIRL vol. II. Elsewhere in DC Comics, 29 titles carried the April or April/may 1963 cover date, according to Mike's Amazing World Of Comics. Also highlighted in this episode are the ads and other features in this issue, including the METROPOLIS MAILBAG letter column! The next two episodes will feature the Superman Family comic books cover dated July 1960, Part I: SUPERMAN'S GIRL FRIEND LOIS LANE 18, and Part II: SUPERMAN'S PAL JIMMY OLSEN 48! Then we will return to the Superman comic books cover dated May 1963, Part I: SUPERMAN 161, and Part II: ACTION COMICS 300! Episode #302 Part I: Superman Comic Book Cover Dated April 1963 Part I: Superman #160! Download Episode 302 Part I! SUPERMAN 160, April 1963 (I misspoke during the recording and said the cover date was April 1960), was published around February 7, 1963. It contained 32 pages for the cover price of 12¢. Mort Weisinger was the editor, and the cover was drawn by Kurt Schaffenberger, featuring the two part story which began the issue. Both stories in this issue have been reprinted in SHOWCASE PRESENTS: SUPERMAN vol. IV. - WHEN SUPERMAN LOST HIS POWERS was written by Leo Dorfman and drawn by Al Plastino. - THE SUPER - COP OF METROPOLIS (9 pgs. ), was written by Curt Swan, pencilled by Curt Swan and inked by George Klein. This story was Siegel's 44th silver age superman story, and his 135th overall for the era. - SUN BOY'S LOST POWERS, published in ADVENTURE COMICS 302, November 1962, published on September 27, 1962 and drawn by John Forte. - THE FANTASTIC SPY for ADVENTURE COMICS 303, December 1962, drawn by John Forte. - THE AMAZING TOTS OF SMALLVILLE, drawn by Al Plastino. - THE SECRET OF KRYPTON'S SCARLET JUNGLE, drawn by George Papp. - THE WAR BETWEEN SUPERMAN AND SUPERBOY, drawn by George papp. - THE SECRET OF THE MYSTERY LEGIONNAIRE. - SUPER LUCY LANE for SUPERMAN'S PAL JIMMY OLSEN 67, March 1963, drawn by John Forte. Next Episode; SUPERMAN COMIC BOOK COVER DATED APRIL 1963 PART II: ACTION COMICS 299! After that episode I will feature the Superman Family comic books cover dated June 1960, Part I: SUPERMAN'S PAL JIMMY OLSEN 45, and Part II: WORLD'S FINEST COMICS 110! Then we will return to the Superman comic books cover dated May 1963, Part I: SUPERMAN 160, and Part II: ACTION COMICS 300! Episode #301 Part I: Superman Family Comic Book Cover Dated May 1960: World's Finest Comics #109! Download Episode 301 Part I! WORLD'S FINEST COMICS 109, May 1960, was published around March 3, 1960. It contained 32 pages for the cover price of 10¢. 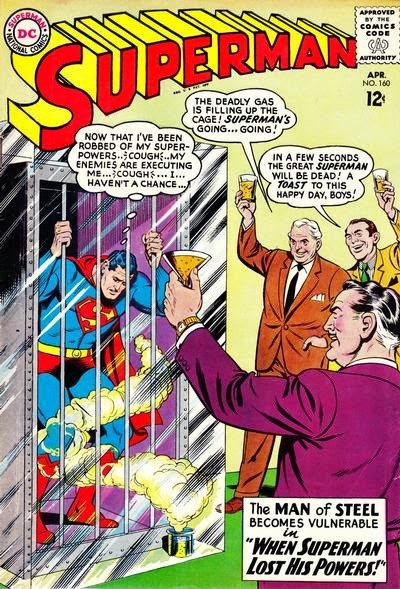 Jack Schiff was the editor, and the cover was pencilled by Curt Swan and inked by George Klein. They were also the art team for the Superman / Batman story in this issue. - The 12 page Superman / Batman story was titled, THE BEWITCHED BATMAN, written by Jerry Coleman. NOTE: In the episode I mistakenly said that Mike's Amazing World Of DC Comics and Comic Book Database.com credited Jerry as the writer, while the Grand Comic Book Database listed the writer as unknown. This story has been reprinted in BATMAN ANNUAL 5 (1963), WORLD'S FINEST ARCHIVES vol. 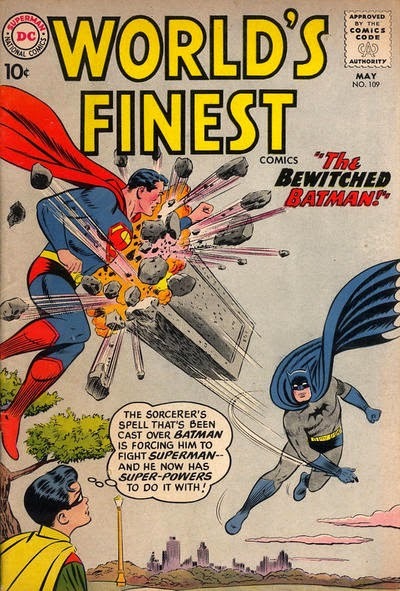 III, SHOWCASE PRESENTS: WORLD'S FINEST vol. I and BATMAN ANNUALS vol. II (2010). I forgot to mention the reprints in the podcast. - Tommy Tomorrow starred in the 7 page story titled, THE AMAZING ASTEROID HIDEOUT, drawn by Jim Mooney. - Green Arrow starred in the 6 page story titled, PRISONERS OF THE GIANT BUBBLE, written by Ed Herron and drawn by Lee Elias. This story has been reprinted in SHOWCASE PRESENTS: GREEN ARROW vol. I. Also highlighted in this episode are the ads and other features in this issue. 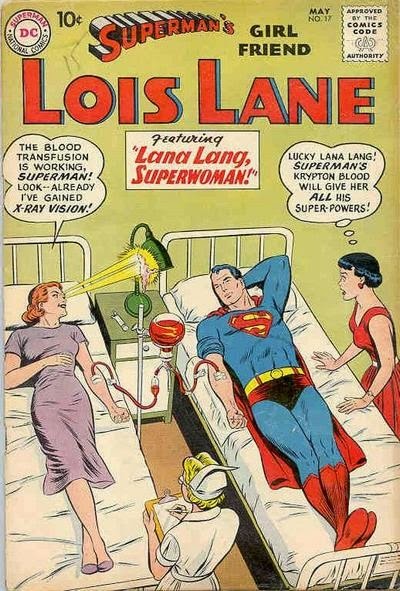 Next Episode: SUPERMAN FAMILY COMIC BOOK COVER DATED MAY 1960 PART II: SUPERMAN'S GIRL FRIEND LOIS LANE 17! The next two episodes will feature the Superman comic books cover dated April 1963: Part I features SUPERMAN 160 and part II will feature ACTION COMICS 299! We will return to the Superman Family of titles cover dated June 1960 with Part I: SUPERMAN'S PAL JIMMY OLSEN 15 and Part II: WORLD'S FINEST COMICS 110!